Arsenal manager Arsene Wenger will be "cautious, not crazy" and not rush Jack Wilshere back after he made his first appearance in 14 months. 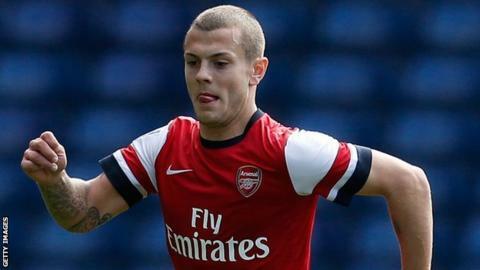 Wilshere, 20, missed the whole of last season with an ankle injury suffered during pre-season in July 2011. He played over an hour for Arsenal's Under-21 side at West Brom on Monday. "Because of his talent you are always pushed in a situation where you would like to rush him back, we have to resist that," Wenger said. "Jack needs a few games, progressive build-up to get his body used to competition again. When you have been out for 14 months, it takes a long time to find your sharpness. You cannot rush it." Wilshere also had minor knee surgery in May. The midfielder made his England debut in August 2010 and has made five appearances to date, the last of which was his last competitive match, against Switzerland in June 2011. "There are three things that are important for every player: the health of the player, the interests of the club and the interests of the national team," Wenger added.